Since the Republican National Convention two themes have appeared repeatedly on editorial pages of newspapers and web sites. The first is a rhetorical question whether facts matter at all any more in American electoral politics. The second asserts that this election may well be a referendum on democracy as we know it. What is perhaps more unfortunate than the intentional misrepresentations by the Bush-Cheney campaign, and the lust for power that motivates them, is the apparent obliviousness of the American electorate, which, if recent polls are to be believed, now favor the misleader-in-chief by a statistically significant margin. The Springfield, MO News-Leader's DeWayne Wickham noted that two years ago Cheney told NBC's Meet the Press that another terrorist attack was inevitable. "...[N]ot a matter of if" said Cheney, "but when." In May of this year Attorney General Ashcroft declared that al Qaeda planned to "hit the US hard" and soon, and in July Homeland Security Secretary Ridge announced "Credible reporting now indicates that al-Qaeda is moving forward with its plans to carry out a large-scale attack in the United States in an effort to disrupt our democratic process." In that context, Wickham wrote of Cheney's remarks, "As scare tactics go, this one is pretty shameless. Shameless because it was on the watch of Bush and Cheney that Osama bin Laden's henchmen carried out the 9/11 attack on this country. And shameless because Cheney's words imply that if he and Bush are re-elected, this country will be spared another such disaster. That's the worst kind of bunkum." Cheney's remark was only the latest in a series of inflammatory falsehoods spewing from the GOP beginning at their convention. Newspapers like the Washington Post and the New York Times, in a change from their earlier laissez-faire attitude toward Bush administration statements and actions, published formal rebuttals of the false claims. Yet the refutations may not have reached many voters, most of whom get their news from local television, where the detailed rebuttals of GOP attacks are unlikely to displace items from the local police blotter. Two of the more extreme claims to emerge from the Republican National Convention concerned George Soros. Soros, a billionaire financier and currency trader, has contributed heavily to MoveOn.org and other liberal causes. From House Speaker Dennis Hastert, who, as the New York Times's Paul Krugman noted is "two heartbeats from the presidency," came the assertion that Soros is in the pay of drug cartels. And from former Speaker Newt Gingrich came the claim that Soros wants to defeat Bush so that he can legalize heroin. As Krugman suggested in a recent column, these sorts of bizarre accusations are the kind of thing one might expect from the followers of Lyndon Larouche, not prominent members of a major political party. Krugman asks and answer the question "Why are the Republicans so angry." First, he suggests, they have nothing to run on. The economic boom that was supposed to follow the windfall tax cuts for the elite few never materialized. The war in which American troops were to be welcomed with "sweets and flowers," and which was supposed to pay for itself with Iraqi oil money, has cost 1000 American lives and $200 billion. Ahmed Chalabi, a principal source of the misguided belief that US occupiers would be welcome, has been implicated in an FBI probe of leaks of confidential information to Iran and an Israeli lobbying group. Cheney, christened the "king of hooey" by columnist Maureen Dowd, boasted of having driven the Taliban from power, while at almost the same time seven people including two Americans were killed by Taliban fighters in Kabul. And after Bush had declared cowboy-style in 2001 that he would find Osama bin Laden "dead or alive" his view flipped in 2002 to "I don't know where bin Laden is. I have no idea and really don't care," and then flopped to the point that he was not even mentioned during the RNC. Krugman suggests that the vitriol is based in part on a guilty conscience. "At some level the people at that convention know that their designated hero is a man who never in his life took a risk or made a sacrifice for his country, and that they are impugning the patriotism of men who have," he writes. And like so much of the Bush administration rhetoric, the oft repeated mantra that the terrorists "hate our freedom" may be more aptly applied to the grunting horde that occupied Madison Square Garden in early September. "... [M]any of the people at that convention, for all their flag-waving, hate America. They want a controlled, monolithic society; they fear and loathe our nation's freedom, diversity and complexity," Krugman writes. The case against President Bush is simple. He sold us his tax cuts as a boon for the economy, but more than three years later, he has driven the economy into the ground. He sold us a war in Iraq as a necessity to protect the United States against weapons of mass destruction, but after spending $200 billion and nearly 1,000 American lives, and after searching the country for more than a year, we've found no such weapons. The RNC offered an opportunity for the GOP to explain why they shouldn't be run out of office for presiding over these disasters, says Saletan. But instead, they pretended their miserable record is a success. As evidence of economic progress, Cheney cited low mortgage rates and high rates of home ownership -- both of which were present before Bush took office. No mention or explanation of the loss of at least one million jobs. "A gathering threat," Cheney called pre-war Iraq in his convention speech. No explanation of what happened to the threat of nuclear, biological, or chemical weapons that could be deployed against the US at a moment's notice. Some of the more extreme rhetoric came from DINO-saur (lizard Democrat In Name Only) Zell Miller. In [Democratic leaders'] warped way of thinking, America is the problem, not the solution. They don't believe there is any real danger in the world except that which America brings upon itself. As Saletan points out, each of Miller's allegations are "demonstrably false." Bush enjoyed broad support among Democrats for the war in Afghanistan, most Democratic senators voted to grant him authority to use military force in Iraq and praised the Iraqi liberation, and Kerry has not said that any other country should decide when the US should be defended. Yet despite press debunking of the bogus allegations, Republican spokespeople continue to repeat these and other false charges. In Saletan's words, "the GOP is trying to quash criticism of the president simply because it's criticism of the president. The election is becoming a referendum on democracy." The ability and right to regard a president's performance critically, demanding -- to use a term the Bush administration is fond of -- accountability, is a vital component of democracy. "Not every country works this way," Saletan notes. "In some countries, the commander in chief builds a propaganda apparatus that equates him with the military and the nation." Miller's charges, suggests Saletan, come very close to the kind of iconization of the chief executive found in dictatorships. By invoking Wendell Wilkie's 1940 campaign, Miller sought to indict the Democrats for making national security a partisan issue -- something Wilkie was very public about refusing to do. But, as Saletan notes, there are several ways to make national security a partisan issue. One is to argue facts and policy, as Kerry as done. Another is frame an issue narrowly as a way of winning an election, as the Republicans did in 2002 by claiming that Democrats who advocated fair labor standards for Department of Homeland Security employees were weakening efforts to combat terrorists. Yet another is what Miller and Cheney did at the 2004 RNC, by in effect claiming that facts don't matter as they charge that their opponents will endanger the country. "I brought Republicans and Democrats together to strengthen Medicare.... Senator Kerry opposed Medicare reform and health savings accounts." The version of Medicare reform that passed was a Republican initiative that was opposed by most Democrats in Congress. Kerry has said that he believe the so-called reform actually benefited the drug companies at the expense of seniors, and he supported an alternative more ambitious set of reforms. "Now seniors are getting immediate help buying medicine." A variety of drug discount cards, some of which are simply promotional programs for particular drugs, became available this summer, but so far only 10% of those eligible have enrolled. The new drug benefit, which will cover 75% of drug costs (up to a limit) for Medicare recipients, does not begin until 2006. "After supporting my education reforms, he now wants to dilute them." Kerry and other Democrats supported the No Child Left Behind Act, which established performance standards for schools, but has since charged that the mandate is underfunded. Recently the Kerry campaign declared that funding for the law is $27 billion short; the White House has acknowledged that funding is below projections. "I believe in the energy and innovative spirit of America's workers, entrepreneurs, farmers and ranchers - so we unleashed that energy with the largest tax relief in a generation. Because we acted, our economy is growing again, and creating jobs, and nothing will hold us back." The economy was in recession in 2001, and after some apparent growth has appeared to falter again this year. Jobs have been created at a slower rate than in past economic cycles, resulting in a net loss of at least one million jobs during the Bush presidency. "My opponent and his running mate voted against this money for bullets, and fuel, and vehicles, and body armor." Most of the funding for body armor was added to the bill in question not by the administration but by House Democrats. Kerry valign="top"supported funding for all of the listed items but in a different version of the bill from that supported by the administration. He opposed the administration bill because there was no provision to pay for it other than increasing the already huge federal deficit. Kerry and Senator Joe Biden of Delaware had proposed an alternate bill that would have provided funding by reducing the Bush $690 billion tax cut over ten years to $600 billion. Cheney cited Kerry for opposing "major defense initiatives" during the Reagan administration, and Miller recited a list of weapons systems Kerry supposedly voted against. The accusations are based on Kerry's participation in the debate about how to restructure the US military in the post-Cold War era. Cheney, who was Secretary of Defense at the time, advocated eliminating the F-14 and F-16 systems. "Poppy" Bush who was then president, proposed eliminating the B2 bomber, and advocated cutting defense spending by 30% over eight years. Kerry did not vote against individual weapons systems, but against a so-called "omnibus" defense spending bill that would have funded all of the disputed weapons systems. Speaking from the Senate floor at the time, Kerry framed his position in economic terms, suggesting that in a time when fiscal restraint was called for, the defense bill did not "represent sound budgetary policy." Like "Poppy" Bush, Kerry singled out the B2 for particular criticism, calling it "one of the most costly, waste-ridden programs in a long history of waste, fraud and abuse scandals that have plagued Pentagon spending." Asked why the Bush-Cheney campaign was criticizing Kerry for positions he held in common with Cheney at the time, White House spokesman Dan Bartlett said, "I don't have the specifics...."
Miller's speech was read in advance and approved by the Bush-Cheney campaign, although the unknown variable was the shouting and facial contortions with which Miller delivered it. Some unidentified "senior Republicans" confided to the Washington Post that -- similarly to Howard Dean's "I have a scream" speech -- Miller's tirade played well in the convention hall, but may have appeared extreme to independent voters watching on television at home. A focus group led by GOP pollster Frank Luntz for MSNBC responded negatively to Miller's generalized criticisms of the Democratic party, but positively to criticism of Kerry, which they seemed to believe was based in fact. Focus group members indicated that the most memorable passage in Miller's speech was his accusation that Kerry supposedly voted against weapons systems. And, in fact, the rest of the electorate may, for the time being, have been taken in by the "sound and fury" In Macbeth, of course, it is "a tale told by an idiot ... signifying nothing." Here, unfortunately, the significance may be what St. Petersburg Times columnist Martin Dyckman a "triumph for the art of propaganda." Dyckman finds Bush's current lead in the polls "dismal" news, more so because "[t]hough they see through him in nearly every other respect, many people are convinced of his leadership, his courage, his sense of resolve." After all, "all we really know about his courage," Dyckman writes, "is how little of it he displayed during Vietnam." This, warns Dyckman "signifies mortal danger for American democracy." The 'man on horseback' mentality, writes Dyckman, "the belief that a leader's strength is more important than where it leads them, defines a population that is vulnerable to dictatorship." 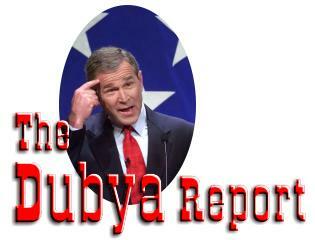 This is not to call Bush a dictator or suggest that he wants to be one. But let no one believe that it couldn't happen here, as has happened so often elsewhere. It has happened here, and by the design of better statesmen than Bush. John Adams, an original American patriot, signed the Alien and Sedition Acts that put people in prison for what they said or wrote. Abraham Lincoln, one of our three greatest presidents, suspended the writ of habeas corpus. Woodrow Wilson, a scholar by profession, jailed and deported people for opposing a war that, nearly a century later, still raises the question of what American interests compelled our participation. Franklin D. Roosevelt put 110,000 men, women and children in concentration camps because of their race. Moreover, Dyckman notes, the Florida legislature acted in a dictatorial fashion when it formally appointed a Republican slate of electors without regard for what any recount might have shown. "Though presumptively legal under the Constitution, that was a dictatorial act in light of the modern expectation that the people, not the politicians, elect the president," writes Dyckman, noting that legislator Tom Feeney was rewarded by being elected to Congress, and nearly all of his colleagues were re-elected to the legislature.